We are working with various partners on the development and production of case studies, newsletters and other publications on agroecology and healthy food systems. We are responsible for any or all of the following: conceptualisation, sourcing, editing, layout supervision, proofreading and dissemination. Below, we present a selection of the publications we have collaborated on, as well as a selection of academic papers by the individual members of Cultivate!. This publication brings together the insights from a landmark meeting in May 2016. 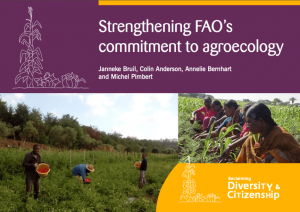 Over 70 individuals shared the fruit from decades of hard field work, research and activism, discussing factors for successful amplification of agroecology, and identifying key lessons from their work. 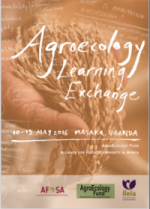 The four day Agroecology Learning Exchange in Uganda was facilitated by Janneke Bruil and Jessica Milgroom, who also compiled this report, available in English and in Spanish. A shorter article summarises the main insights of the meeting. Van den Berg, L., Roep, D., Hebinck, P., Teixeira, H.M. (in press). Reassembling nature and culture: Resourceful farming in Araponga, Brazil. Journal of Rural Studies. Wezel, A.; Goris, M.; Bruil, J.; Félix, G.F.; Peeters, A.; Bàrberi, P.; Bellon, S.; Migliorini, P. 2018. 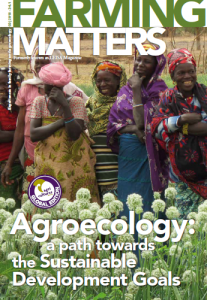 Challenges and Action Points to Amplify Agroecology in Europe. Sustainability 10, 1598. Van den Berg, L., Hebinck, P., Roep, D., 2018. ‘We go back to the land’: processes of repeasantisation in Brazil. The journal of peasant studies 45(3): 653-675. Timmerman, C., Félix, G., Tittonell, P., 2017. Food sovereignty and consumer sovereignty: Two antagonistic goals? Agroecology and sustainable food systems 42(3). Timmermann, C. & Félix, G.F. 2015. Agroecology as a vehicle for contributive justice. Agriculture Human Values 32: 523. Milgroom, J. 2015. Policy processes of a land grab: at the interface of politics ‘in the air’ and politics ‘on the ground’ in Massingir, Mozambique. Journal of Peasant Studies 42(3-4):585-606. Milgroom, J., K. E. Giller, and C. Leeuwis. 2014. Three interwoven dimensions of natural resource use: quantity, quality and access in the Great Limpopo Transfrontier Conservation Area. Human Ecology 42(2):199-215. Milgroom, J., and K. E. Giller. 2013. Courting the rain: Rethinking seasonality and adaptation to recurrent drought in semi-arid southern Africa. Agricultural Systems 118:91–104. Milgroom, J., and M. Spierenburg. 2008. Induced volition: Resettlement from the Limpopo National Park, Mozambique. Journal of Contemporary African Studies 26(4):435-448.